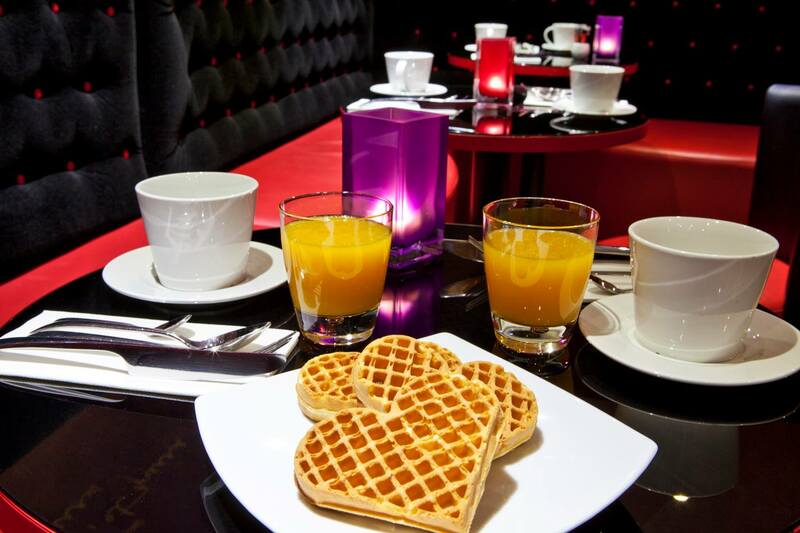 This 4-star hotel is located near the Sacré-Coeur Basilica, within walking distance of the Moulin Rouge. It takes 15 minutes to get to the Opera Garnier and the Louvre Museum. Just 5 minutes walk from the major sightseeing attractions. The old town is close by and the hotel is easily accessible from all major highways. From the outside, this hotel can be taken for a special lavish boutique. Come inside, and any of your ideas will be swept away in a whirlwind of such eclecticism which is likely to be found only in a contemporary hotel in Paris. Everything is curious and becomes curioser every minute, which tempts one to stay on and study it all in detail. The lobby is decorated with red mosaic heart, red chairs, soft red photo of passionate lovers on red wall ... Here are a portraits of couples on the wall, a glowing mosaic on the floor, fabrics and materials all red. 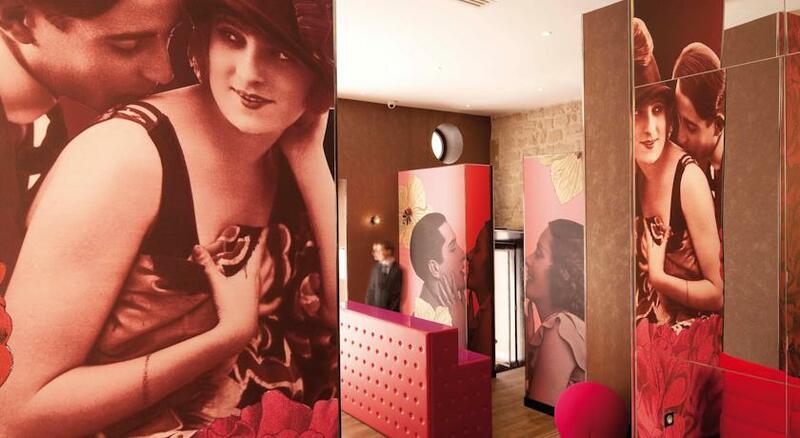 A shade of red, which can be seen everywhere, has been specifically designed and developed for the hotel Montmartre Mon Amour. It is called Montmartre Mon Amour Red. Anyone who is good, or even half-good with words would want to compose a flowery ode to praise Montmartre Mon Amour Hotel in Paris; it is worthy of it. But it would be difficult to try to find an unusual angle to look at this hotel trying to find a suitable metaphor, because this creation of architectural courage is a metaphor in and of itself. Space design? Sure. It’s well designed decoration of premises and furniture are like stage directions in a play. All 12 rooms (eight cozy rooms, four superior rooms, 12 classic rooms) are designed with a theater effect in mind. Staying there is fun, because designers indulged their sense of fantasy in every detail. There are many other strange things here, but not just that, otherwise it wouldn’t have been a good hotel; if you are looking for traditional hotel virtues, comfort and service, you will find them here as well. Designers were very attentive to the comfort factor. 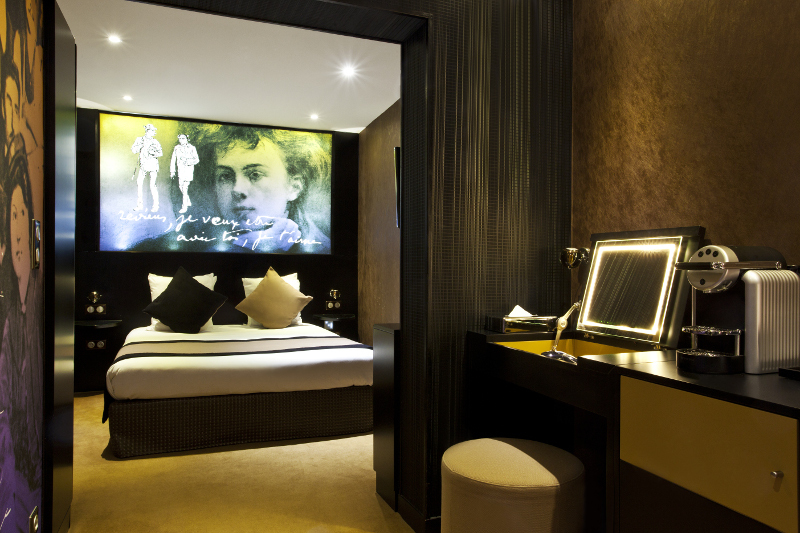 All rooms at “Montmartre Mon Amour” hotel, are designed for comfort. So regardless of whether you need an inspiration and quiet place to work or simple down-time, the comfortable, quiet, clean and enjoyable atmosphere of this hotel will make you feel right at home. It is a great alternative if you wish to escape the monotony of international standard hotels. It’s interesting architecture, colourful interior and relaxed ambience provide a pleasant living space and offers intimacy, peace and comfort. Room furnishings combine materials of the finest quality and a personal touch. 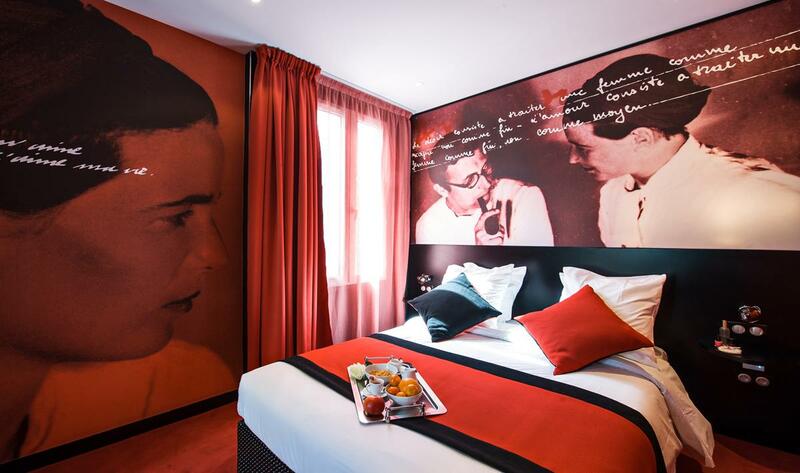 While no two rooms of Hotel Montmartre Mon Amour are the same, all feature modern furnishings, contemporary art pieces, fascinating items and a carefully designed ambiance. Designers started with more classic elements and moved toward modernity. Playing up materials like wood, stone and fur, with little ‘couture’ accents like the red poufs in the lobby and heart-shaped stairs decorated with red mosaic. The kind of detail that guests love. 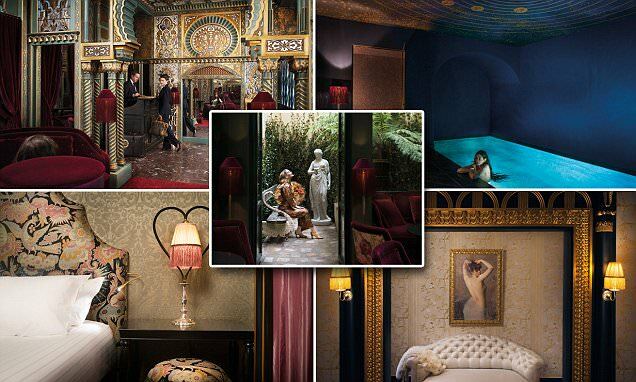 A series of new suites in a very couture spirit, with an original palette. Staying in this hotel you can not feel lonely even in the single room. Portraits of couples on the walls create the effect of presence and participation. Victor Hugo and Juliette Drouet, Jean-Paul Sartre and Simone de Beauvoir, Edith Piaf and Marcel Cerdan, Romain Gary and Jean Seberg, Charles Baudelaire and Jeanne Duval, Guillaume Apollinaire and Lou, Paul Gauguin and Tehura, Verlaine and Rimbaud ...(suit dedicated to the love affair between 19th century poets, Paul Verlaine and Arthur Rimbaud). ‘She was still gorgeous in his eyes’- is written in the Deluxe room Romain & Jean, dedicated to the love story of the American actress Jean Seberg and Romain Gary. “The blue sky above us might collapse and the earth might fall but it wouldn't matter to me, as long as you love me... "- a hymn of love of Edith Piaf and Marcel Cerdan. 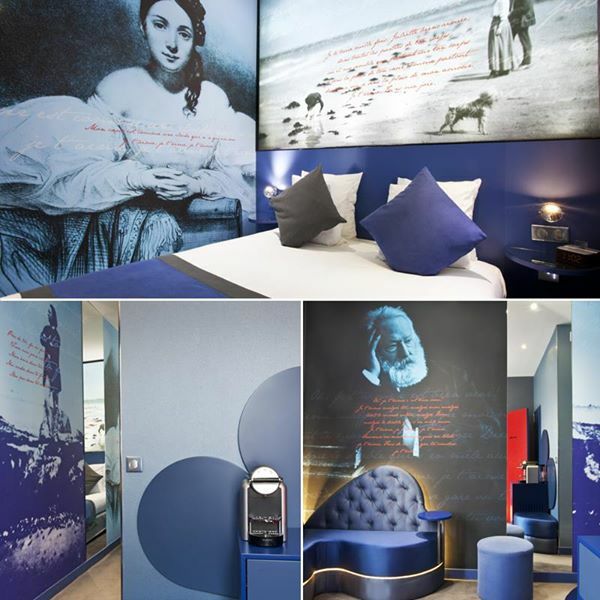 “Love is a crime in which no one can do without an accomplice "- is written in a room dedicated to the love of Charles Baudelaire and Jeanne Duval. However, the romantically inclined guests must expect not only vivid pictures in the head and some of the inscribed words of love, but also the whole arsenal of love: champagne, rose petals on the bed and a special secret gift box. 1. For those who are not comfortable to start their own love improvisation surrounded by actors, singers, artists, writers, should give preference to the more neutral numbers, which are also divided into two themes: those who pay tribute to the Montmartre and Paris (and a French film "Paris, Mon Amour" (Paris, my love), “Secrets d'Amour" (Love Secrets) 'Montmartre Mon Amour" (Montmartre, my love) and "Stolen Kisses." The colors are varied and include not only black and red but also blue and purple. 2. For those who avoid any kind of ambiguity is better not to settle in a room dedicated to gay love of 19th century poets, Paul Verlaine and Arthur Rimbaud. 1. The hotel is in a very nice location 2.The staff is extremely helpful, friendly and does not invade your personal space 3. Wi-Fi. 4. All rooms are equipped with LCD TV and a private bathroom, minibar, air conditioning, in-room safe, a double bed, a hairdryer, machine Nespresso. 5. Near the reception there is a small reading area. The breakfast room is decorated with the same muted red and black tones, creating an intimate atmosphere in which the lovers dissolve like a sugar cube in a cup of coffee. Romantic continental breakfast with fresh products (biscuits, toast, almond biscuits, cereals, fruit, sausages, eggs, salads to choose from) is delicious. Heart-shaped wafers are divine! 1. The rooms and the bathroom are small. 4. For those who do not like walking and someone frightens walking uphill, the disadvantage is the location of the hotel, which is located at the foot of the hill of Montmartre. 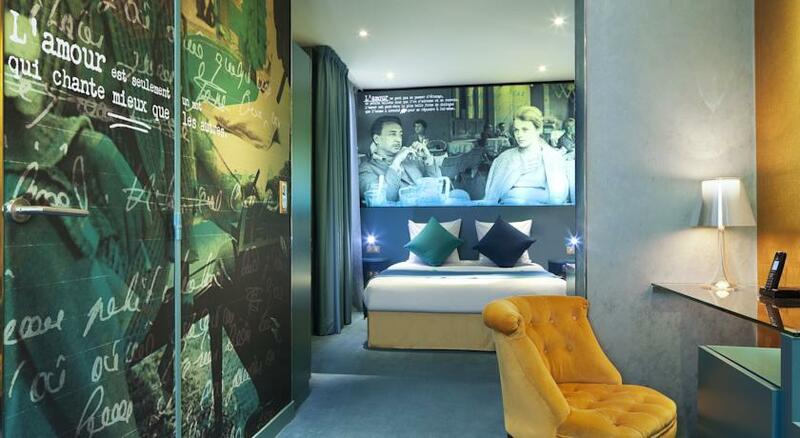 ​The Montmartre Mon Amour hotel in Paris may not be a great choice for: conservative travelers looking for a "normal" hotel or for those who can not imagine life without large hotels. ​It’s a good choice for romantically minded citizens and lovers dreaming to find a quiet cozy place. Good soundproofing, ideal for couples who value privacy and intimate and delicate atmosphere (rose petals spread across the bed and bottle of champagne). Special offer of «Montmartre Mon Amour» hotel 4* includes services for couples, that will make staying here even more pleasant.